One new thing I've been working on are these minis- an idea presented to me by a friend who thought some of my photos would works well on a smaller scale. 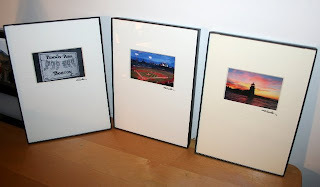 The frames are 5x7" document frames which create a simple, clean look. The mats have little 2x3" openings that are 1.5" from the top. I actually had the mats commissioned by an Etsy supply seller, Q Branch Ltd, and they turned out great! I've been using photos that have bright, distinct colors as well as contrast-y black and whites. They debuted this weekend at JP Open Studios and got a positive response so I am excited to make more! They will be available on my etsy page soon, please contact me for more details.